GRAND RAPIDS March 6, 2015– Republican lawmakers in Wisconsin, along with Gov. 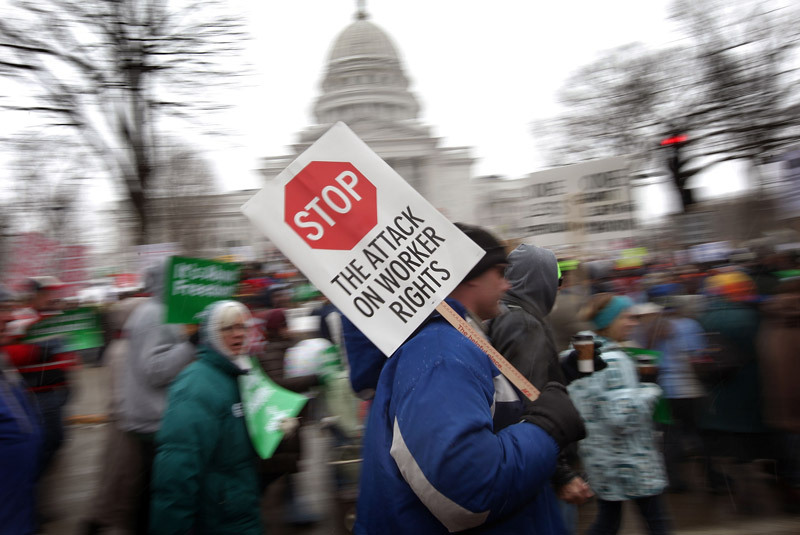 Scott Walker, are back to their union busting ways. The Badger State’s right-wing politicians continue to ramp up their passage of right-to-work legislation amid tens of thousands of union protesters at the Madison state capitol– a scene reminiscent of Walker’s 2011 attack on Wisconsin public employees, as well as Michigan’s own right-to-work battle in Lansing in 2012. More than two years after Republican legislators and Gov. Rick Snyder promised that passing right-to-work in Michigan would benefit our economy, we have yet to see any real results with new jobs, higher wages or new business. In fact, as a result of a weakened labor movement, wages continue to stagnate for the middle class, and Michigan unemployment (6.4%) remains higher than surrounding states that haven’t passed right-to-work laws (Minnesota 3.7%; Missouri 5.4%; Ohio 5.1%; Illinois 6.2%). So why do Republican lawmakers continue to think right-to-work will create jobs and improve economic conditions for the middle class? And what will happen to the middle class if these anti-union laws continue to spread across the country? “If anti-worker laws continue for the next 20 years, everyone can expect wages, benefits and working conditions to continue to decline. There will be no real labor movement that will be taken seriously to speak for workers’ rights. Other anti-worker laws will become a common thing. Labor solidarity could possibly become a thing of the past. This entry was posted on March 6, 2015 by WMALC in Political news and tagged Brandon Dillon, Democrats, Grand Rapids, Ironworkers, Lansing, Michigan, Republicans, Rick Snyder, right-to-work, Sheet Metal Workers, wages.